01.02.2006 - Some dead animal removal jobs are very challenging - they involve persnickety housewives who recoil at the smell of day-old milk, and can somehow sense a dead flea in the wall on the other end of the house. I arrive, can't smell anything above the scent of 50 sticks of incense and 30 lavender candles, but persist on until I find the littlest critter tucked away in some impossible to find god-forsaken back corner of the house, barely raising the slightest perceptible odor. Those are the lousy dead animal removal jobs. This one, this one was a pure pleasure. It was easy. Very easy. I knew that it would be easy when I could smell it before I even entered the home, and when I saw about 444 flies buzzing in the house. Smelled like easy money to me. I walked right to the rear of the house - I didn't even have to follow my nose - the fly density was highest back there, and saw a large stain on the drop ceiling. I put on my respirator mask, popped off the adjacent ceiling tile, and was greeted by this beauty. This is the largest dead opossum that I have removed to date. It was thus also one of the smelliest, and thus one of the easiest to find. I took out the whole ceiling tile, which of course had to be replaced, seeing as how possum juice had saturated the thing. Pictured is the dollar that I got paid to remove it, which provides a good size comparison. How did this opossum die inside the house? And why had the homeowner let the place reach Level 7 Stink Status (roughly the same as the bottom of a port-o-potty) before calling me out? The answer is that they were cheap bastards. 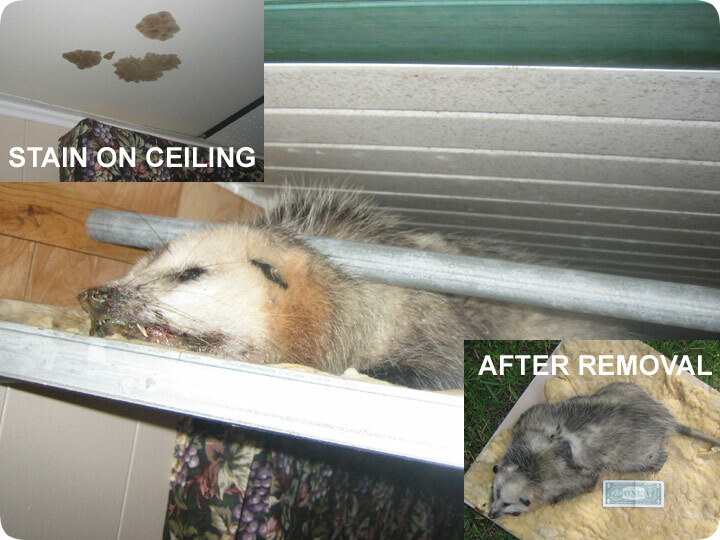 The opossum died inside the house because they knew that they had an animal living in the ceiling, and they saw the hole that it was using to get into the ceiling from the outside, so they took matters into their own hands, and they sealed the hole shut. They did so when the animal was inside. It couldn't get out, and it died. I doubt it died of starvation, seeing as it was fatter than the woman living there, so it must have died of dehydration. Then when it started decomposing, I think it was the pressure of the neighbors, who could smell the thing next door, that got them to finally have me come remove it. They learned a valuable lesson - if you've got an animal in the ceiling, sooner or later, you're going to have to call your friendly neighborhood wildlife operator. It's up to you to do it before 444 flies swarm in search of possum drippings, or after.